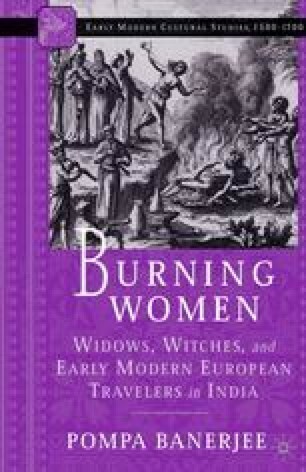 The scopic paradigms of viewing punishments that produced such different ways of viewing widowburning and witchburning suggest that European writers were employing specific rhetorical and visual strategies to represent sati to their audiences. There emerged a particular genre of writing about sati and the writers participated self-consciously in that tradition. Historians and brahmanical scholars have maintained that widowburning was the exception rather than the rule. But the almost mandatory inclusion of reports—preferably eyewitness accounts—of sati in early modern travelogues suggests that the rite was inseparable from European writers’ imaginings of India.1 Many early commentaries of sati offered remarkably detailed productions of the burning scene. Before the end of the sixteenth century, educated Europeans appeared to be familiar with most of the ingredients they thought were necessary for the ritual. Montaigne, who had never set foot in India, was able to reconstruct an account of widowburning in remarkable depth and particularity in his essay “Of Vertue.” Montaigne did not offer his description as an eyewitness testimony, but then he did not have to. The details of sati he provided appeared in scores of travel narratives. Witnesses registered the burning with somber specificity.